Escape civilization in Plana Novella. Enjoy stunning views of the mountains and peace and tranquility rarely found along the Spanish coast. Located in a secluded neighborhood in the middle of a national park, only 6 miles to popular beaches and 8 miles to the beautiful town and beaches of Sitges. Swimming pool, child-friendly 5 bedrooms, 4 full bathrooms; hardwood floors throughout, a large (45m2) living room with double-high ceiling and fireplace, large open modern kitchen, 3 terraces including a romantic secluded one off the master suite. Recently completed to the highest standard, it is fully equipped w/ broadband internet, WIFI, Wii video game console, TDT TV, stereo, A/C, central heating, washing machine, dryer, dishwasher, induction stove, convection oven, microwave, 2 fridges, and BBQ. Recently added petanque/bocce court for leisurely afternoon fun. Come celebrate any holiday in Garraf! Plana Novella is also home to the famous Buddhist Temple. The region is well known for its wine & cava production. Surrounded by vineyards, visits to local bodegas and wineries are possible. Garraf region: Garraf is Catalunya's second smallest comarca but packs a lot into its 184 square kilometers. Situated on the Costa Garraf, just south of Barcelona, the region's beautiful coastline includes 25 kilometres of large sandy beaches and tiny secluded bays almost hidden beneath rocky cliffs. The Parc Natural de Garraf in the east covers 13,000 hectares. The low limestone peaks of the Garraf massif create a wild landscape and habitat for a number of rare and protected species like the European fan palm, Mediterranean tortoise, wild boar, and red fox. The Parc Natural de Garraf is full of paths for walking and cycling, as well as many caves just waiting to be explored; Jafra Natura based in Olivella runs guided activities at weekends. Other activities on offer in the park include group workshops and courses in astronomy at the Observatori Astronòmic del Parc del Garraf. The region's historical monuments include seven castles that date from the 10th to 17th centuries. Things to see - Sitges: Just down the coast is the old fishing town of Sitges. When Modernista artist Santiago Rusiñol moved there in the late 19th century he was instrumental in putting the town on the artistic and cultural map, by hosting festes modernistes in his home and studio, Cau Ferrat, which is now a museum and gallery. Cau Ferrat is situated in a lovely old quarter, Racó de la Calma (literally, ‘quiet corner'), just along from another important cultural site, the Museu de Maricel, housed in the Palau of the same name built in the early 20th century for an American millionaire. The museum also encompasses Rusiñol's friend and fellow artist Ramon Casas's house, and has collections of art and sculpture spanning many centuries and styles, as well as an interesting exhibition of maritime artifacts. Sitges continues to be a magnet for creative minds and one of the favourite subjects for artists is the 17th-century Baroque church of Sant Bartomeu i Santa Tecla. Things to see - Vilanova i la Geltrú : Vilanova i la Geltrú is the comarca's capital, situated in the southwest of the region. It is one of Catalunya's principal fishing ports and became known as ‘Havana Xica' because of the number of buildings from the ‘Americanos' period. The main town centre is concentrated around the Rambla Principal which is lined with café terraces, all the main shopping chains and the occasional Modernista building. Slightly further north is the arched Plaça de Vila, which leads off through narrow back streets and small squares to the old town centre of la Geltrú and its medieval castle. The Barri Marítim has many attractions such as Ibero-Roman ruins, a defence tower, a lighthouse and a fishermen's market and harbour, where visitors can join locals to greet the fishermen as they return from their day at sea. The town also has 5 beaches and if you are looking for somewhere to cool off there are some pleasant parks and gardens such as the Jardins del Parc Gumà i Ferran with waterfalls, and shady trees. There are two golf clubs in Garraf: Club de Golf Terramar in Sitges is an 18-hole par 72 course situated on the coast with large practice areas, as well as tennis courts and a swimming pool, while Escola de Golf Portal del Roc in Vilanova has a par 54 pitch-and-putt course. We built this dream home together. We designed the interior to be a 21st century luxury home, with all the modern conveniences and high standard finishes that one would expect from a property of this caliber. Air conditioning is available throughout including in every bedroom. The villa is set within the Garraf National Park. The tranquility and peace it offers is unsurpassable. To be part of the surrounding nature and at the same time to be surrounded by all the modern comforts of today's living is a perfect blend. We are also an active family and we use the park to its full advantage: walks, biking, trekking, discovering nature etc. The property offers solitude but its also on the doorstep of Sitges and Barcelona so we can dip in and out of suburbia as and when we want to. For us, the property has so many but here are just a few that come to mind: Space, peace, tranquility, nature, the pool, the garden, the chance to entertain indoors as well as out and of course, the design and comfort of the house itself. So much natural light and the openness of the garden. Master bathroom is spacious, with large 2 person bath, separate shower enclosure, 2 sinks and mirrors. Private outdoor hot/cold shower is perfect after returning from the beach. Extra dining table and 6 chairs available. Additionally, 2 covered outdoor terraces with plenty of space for relaxing dining. Hook up your IPod and chill. Enjoy the CD player. Large poolside terrace with 4 sun-loungers and 8 chairs is sunlit all day. Child friendly environment, plenty of toys and activities. Large outdoor sandbox. Lawn area for relaxing. 3 terraces for dining, dancing, relaxing. Hammock ready to be enjoyed. Baby cots and high chairs available. 2 children's beds available. The location in the middle of a park is relaxing and peaceful. The property is very spacious and easily accommodated our 2 families. Comfortable beds, kitchen well equipped, and spotlessly clean. The various outdoor living spaces are wonderful places to enjoy the nature all around. We made great use of the refreshing pool and had several barbecues. A great escape from the otherwise busy Spanish coast. Beautifully decorated with style. A++ for all 3 families. Sparkling clean with huge spaces throughout to relax and enjoy the home and surrounding nature. Property is private and a nice change from the busy coast. Plenty of hiking trails around the park. One day we even hiked down to the beach on a country path, some 6 miles. Luckily we caught a ride back with our friends and made it to the pool just in time for happy hour. 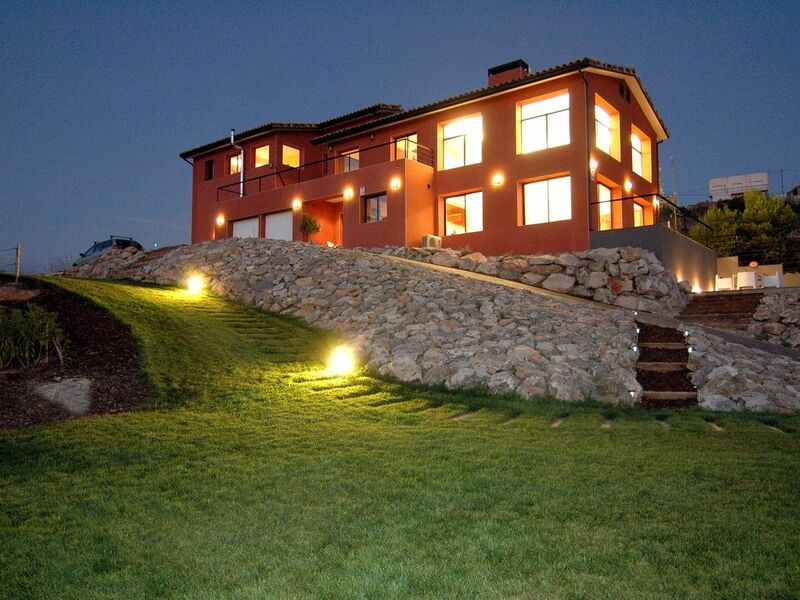 A comfortable villa ideally located with great 360' views. Renting a car is needed to explore the area. Can't thank you enough Alice for some fantastic memories. We had a wonderful 2 weeks in this exceptional house and particularly enjoyed the sweeping views of the park and the peacefulness of its location. The house is spacious with enough room for everyone and always a quiet corner if needed. Everything was well equipped and loved the open interior design of the kitchen and dining/living area. Everything was as described and well-maintained, and the owners easy to communicate with and helpful. We would certainly recommend this home and hope to come back ourselves in the future. Fabulous modern villa with all the facilities you need in a great location. The home is stylish throughout with comfortable beds and plenty of wardrobe/storage space. I would highly recommend this villa - Richard and Alice are perfect hosts - and Barcelona coast is a lovely location for a holiday. Plenty to see and do for all ages. I can't say enough about this villa. Our families had a wonderful 14-day stay in the middle of nature. The house was beautiful, immaculately clean, and airy with plenty of space to stretch out. The covered terraces were great for our daily outdoor meals. For months before our trip Richard answered any and all questions about Barcelona and gave us tips and advice. My kids wanted to stay all Summer! Thanks. Near the beautiful town of Sitges and its beaches. Sitges, an old fishing village, has become the hip town south of Barcelona. The annual film festival and year-around fiestas attract the fabulous crowd to this resort by the sea. Wine producing region of Vilafranca Del Penedes filled with vineyards, beautiful country roads, and medieval villages and towns. Close to beaches of Castelldefels and Sitges with surfing, snorkeling, scuba diving, yachting, sailing, horseback riding, ponies, go-carts. Located in the heart of Parc Natural del Garraf. Mountain region with plenty of fresh air, bird-watching, wildlife (wild boar, foxes, quail, bunnies, tortoises, etc), mountain-climbing, mountain-biking, cave exploration. Next to Buddhist temple of Palau Novella. Unspoiled views and surroundings which is unusual for Spanish coastal area. Peaceful getaway at the end of the world yet close to everything. 15 minutes from several large shopping malls. 25 minutes from Barcelona El Prat airport. 30 minutes from Barcelona, with its covered markets such as La Boqueria, Las Ramblas walking street, Olympic stadiums, famous zoo, aquarium, Champions League Barcelona Barca football team, vibrant nightlife, Gaudi's Sagrada Familia cathedral and more! Golf: There are two golf clubs in Garraf: Club de Golf Terramar in Sitges is an 18-hole par 72 course situated on the coast with large practice areas, as well as tennis courts and a swimming pool, while Escola de Golf Portal del Roc in Vilanova has a par 54 pitch-and-putt course. *Please Note: The owner accepts other currencies if specifically agreed in advance. Security deposit of600EUR/700USD/500GBP is required when receiving the keys, and additional 200€/week for cleaning service. For reservation, an initial payment of 25% is required. Full payment is due 10 weeks before the beginning of the rental. Water and electricity are charged at cost based on consumption. Rates in Spain are higher than in US/UK.